Stars: Harrison Ford, Daisy Ridley, John Boyega, Peter Mayhew, Adam Driver, Carrie Fisher, Max von Sydow, Andy Serkis, Mark Hamill, Run Time: 135 min Rated: PG (Canada) PG-13 (MPAA) for sci-fi action violence. For an Initial Response/spoiler-free review of The Force Awakens click here. Click the banner below to listen to audio from a radio interview about this review with Pastors Ted Giese and Todd Wilken on IssuesEtc.org where Christianity meets culture. By downplaying Luke Skywalker (Mark Hamill) in the trailers of Star Wars: The Force Awakens director/writer J.J. Abrams created a clever diversion. Speculation swirled around the idea that a Luke Skywalker, fallen from grace, could be the new film’s villain Kylo Ren (Adam Driver). This was just one distraction designed to keep the plot and major details of the film under wraps until fans could see it for themselves. Respectfully, the Star Wars fans took up the task and participated to keep spoilers to a minimum and avoid talking about a major death in the film. Upon viewing the film, it quickly becomes clear that the destruction of another Death-Star-like, planet-destroying super weapon called Starkiller Base is not the most important element of The Force Awakens. Nor is it the simple plot of orphaned fugitives finding their way into an intergalactic band-of-resistance/freedom-fighters to battle against the First Order. The film isn't even about finding Luke Skywalker. [Spoiler imminent] This movie is about the death of Han Solo (Harrison Ford) and its implications. 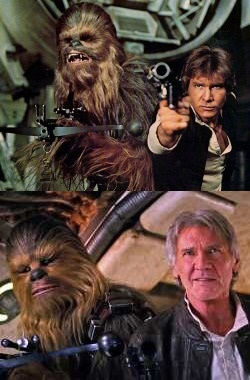 An integral part of Han Solo's death is how he is killed, by whom, and what his death produces. He doesn't die in a heroic blaze of glory as the Millennium Falcon explodes around him in the vacuum of space. He doesn't die going toe-to-toe with a bounty hunter like Boba-Fett. No. Han Solo is murdered by his son Ben, the product of Han’s relationship with Princess Leia Organa (Carrie Fisher). 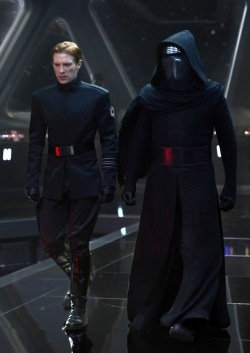 Ben turns out to be the mysterious, masked villain Kylo Ren. There is a term for this kind of murder, it's called patricide. The Old Testament records a famous instance of patricide. After failing to capture Jerusalem, Sennacherib king of Assyria went home to Nineveh. As he worshipped in the house of Nisroch his god, Adrammelech and Sharezer, his sons, struck him down with the sword and escaped into the land of Ararat where Esarhaddon, his son, reigned in his place. On the whole patricide is rare in Scripture. Perhaps a better example of patricide from the Bible, which may be worth contemplating after watching The Force Awakens, is a case of attempted patricide by King David's son Absalom. David's family was complicated and filled with step-siblings from multiple concurrent marriages. After Absalom's half-brother Amnon raped Absalom's sister Tamar, Absalom was unhappy with how their father David dealt with the tragic situation. In his disappointment and anger Absalom took justice into his own hands and plotted the death of his half-brother Amnon. That death sparked the seeds of revolt in Absalom who then openly worked to overthrow David. Had Absalom succeeded in this endeavour David would have died even at Absalom's own hands. For his part David did not want to see his son die and did everything he could to bring Absalom home and provide forgiveness even after he had turned against his family. In the end David even ordered his commanders to, "deal gently for my sake with the young man Absalom." The disappointment of a son with his father is part of The Force Awakens. While Kylo Ren interrogates Rey (Daisy Ridley), a young scavenger, in an effort to track down and murder Luke Skywalker his uncle, old master, and last of the Jedi, Kylo Ren provides some personal commentary as he says to Rey, "Han Solo ... You feel like he's the father you never had. He would've disappointed you." Like Absalom, Ben Solo/Kylo Ren is disappointed in his father who he later describes as "weak and foolish." Since Ben Solo's childhood and early-adulthood falls within the 30-year gap between Return of the Jedi (1983) and The Force Awakens the nature and cause of this disappointment is a mystery. Something happened in the past that resulted in Ben Solo becoming Kylo Ren. Without specifics Han Solo recounts to Rey how Luke Skywalker once had a young apprentice who turned on him and destroyed the Jedi school Luke was establishing. Lurking in the background of this betrayal is Supreme Leader Snoke (Andy Serkis) who likely tempted Ben Solo to the dark-side of the force presumably dubbing him “Kylo Ren,” Master of the Knight of Ren. It is implied that this tragedy broke Han Solo’s and Leia Organa’s relationship. It also drove Luke Skywalker into self-imposed exile. Kylo Ren: Han Solo. I've been waiting for this day for a long time. Han Solo: Take off that mask. You don't need it. Kylo Ren: What do you think you'll see if I do? Han Solo: The face of my son. Kylo Ren: Your son is gone. He was weak and foolish like his father, so I destroyed him. Han Solo: That's what Snoke wants you to believe, but it's not true. My son is alive. Kylo Ren: No. The Supreme Leader is wise. Han Solo: Snoke is using you for your power. When he gets what he wants, he'll crush you. You know it's true. Kylo Ren: It's too late. Han Solo: No, it's not. Leave here with me. Come home. We miss you. Kylo Ren: I'm being torn apart. I want to be free of this pain. I know what I have to do but I don't know if I have the strength to do it. Will you help me? "Anything" tragically ends up being Han Solo's death at the hand of his son. In a way, when it comes to the character of Kylo Ren/Ben Solo The Force Awakens is like cement setting. Could something yet be written in that cement before it's completely hardened? 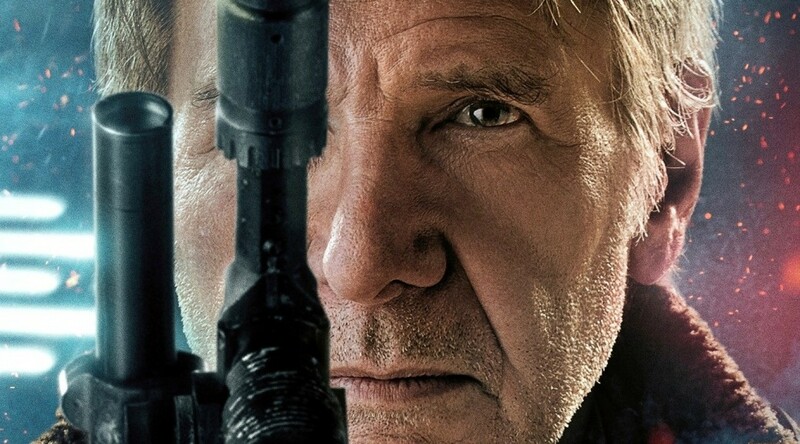 Did Han Solo’s death mark the moment when nothing more can be written? Did Han Solo’s death mark the true death of Ben Solo and the final birthing of Kylo Ren? In light of the Anakin Skywalker/Darth Vader character arch developed in the original trilogy is there hope for grace and Ben Solo’s redemption? Who could be the catalyst for this redemption? Could it be his uncle Luke Skywalker? Could it be the forgiveness and love of his mother Leia Organa? Could it be his new rival Rey? Might Kylo Ren/Ben Solo face an ignoble end like the Biblical Absalom similarly caught with his head and hair in the branches of treachery? Han Solo's death raises many questions. A large part of what makes The Force Awakens a legitimate Star Wars film is how it employs mystery in its storytelling, a sort of "how did we get here?" element absent in the prequels - The Phantom Menace (1999), Attack of the Clones (2002), and The Revenge of The Sith (2005). 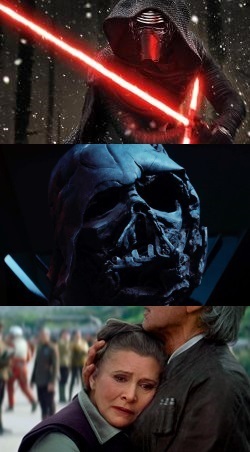 While Christian viewers of the original trilogy - A New Hope (1977), The Empire Strikes Back (1980), and Return of the Jedi (1983)can contemplate the question "how does one honour their father when he turns out to be a villain?" The Force Awakens sets the stage for a potential Prodigal Son story complicated by patricide which would make the return journey home even more bitter-sweet for a broken Ben Solo. By murdering his father Ben Solo fails to honour his parents. In the Large Catechism Luther writes that, "[children] should remember that however lowly, poor, frail, and strange their parents may be, nevertheless, they are the father and mother given to them by God. Parents are not to be deprived of their honour because of their conduct or their failings. Therefore, we are not to consider who they are or how they may be, but the will of God, who has created and ordained parenthood." Although Star Wars in general is pop-cultural fodder it has transcended the pop-culture boundaries to occupy the imagination of generations of viewers. Like a good fairy tale, the troubled father/son relationships in these films can provide opportunities for deeper contemplation on the nature of fatherhood in modern culture. For a film franchise marketed towards families, viewers will find abundant occasions to talk about what it means to be a father/parent and what it means to be a son/child. Ignoring these openings to talk about forgiveness within families, whatever the family dynamic, would be a missed chance to build stronger and better relationships. Christian viewers will want to draw that conversation back to a discussion about the ultimate and most virtuous of Father/Son relationship—the relationship recorded in Scripture between Jesus and His Heavenly Father and what that means for the Christian who is now part of that divine family. Amidst the droids and light-sabres of The Force Awakens something else has re-awakened: a love for the Star Wars that many first enjoyed years ago. 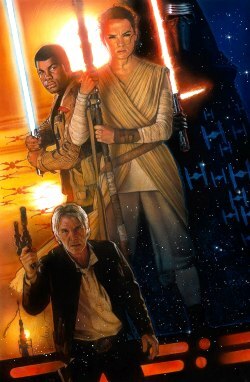 Director/writer J.J. Abrams has delivered a good start to this new chapter in the Star Wars saga. Regina, Saskatchewan, Canada; a contributor to KFUO AM Radio, Higher Things Magazine, The Canadian Lutheran and Reporter; and movie reviewer for the “Issues, Etc.” radio program. Follow Pastor Giese on Twitter @RevTedGiese. Check out our Movie Review Index! You can also find this article featured in the Canadian Lutheran. Concordia: The Lutheran Confessions, Large Catechism: The Fourth Commandment, Concordia Publishing House 2006, Page 511.